C. Teijeiro Barjas, H. Ganesan, R. Halver, W. Homberg, G. Sutmann. Connection between an application and the simulation framework. The use of different simulation methods in materials science is necessary to provide accurate and efficient solutions for each specific time and length scale: e.g., an accurate description of atom properties requires a high amount of information, but the analysis of microstructures takes higher level descriptions of compounds. Nevertheless, the implementation of scale-bridging techniques requires specific modelling efforts in order to transfer information between different approaches, as well as suitable computational tools that facilitate the connection between simulations. In this aspect, the present work describes the first steps in the development of a parallel cell-based framework for the optimised execution of a wide variety of simulations. The proposed framework acts as a skeleton that defines parallel simulations by using the concepts of domains, cells and components as its central constructs, and also incorporating further functionalities in a modular way (e.g. load balancing algorithms). The correct management of the framework has been tested with a first example, which consist in the coupling of molecular dynamics with Monte Carlo to show the segregation of carbon (C) in a defect bcc iron (Fe) structure. 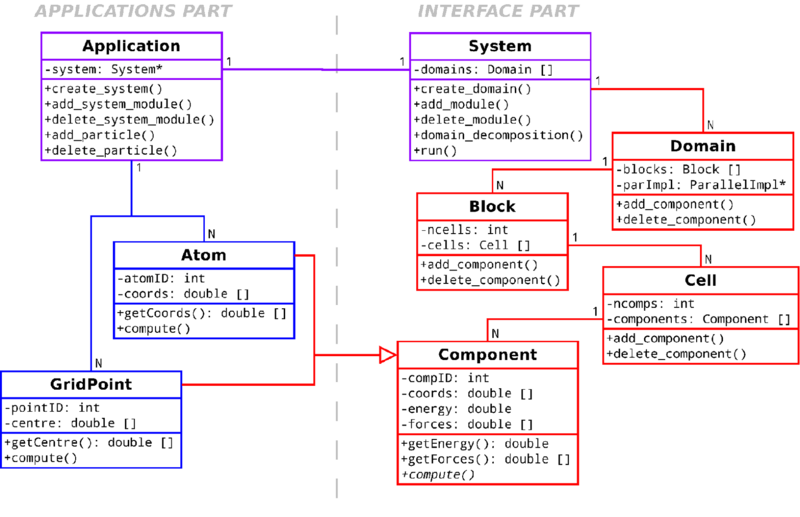 The existing code is connected to the framework to obtain a parallel execution with domain decomposition and load balancing. The test results give a good perspective of the current potential of the simulation framework, and also help to guide the future developments and improvements.